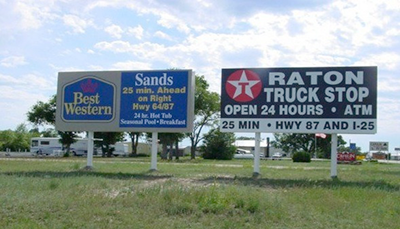 Freeway billboard advertising is among the most effective out-of-home (OOH) advertising options. Billboards are huge and located on busy freeways and major roadways. A freeway is a toll-free highway with controlled access. On the freeway, you will usually see a bulletin. A bulletin is the largest standard size billboard. They stand 14 feet high and 48 feet wide. Bulletins provide high visibility and maximum exposure. They are available in almost all markets. Billboards placed along the freeway command drivers attention and bring awareness to your brand! Along with the high visibility of freeway billboard advertising, the creative freedom of these huge bulletins will leave a lasting impression for your audience. Billboards are visible 24/7 so drivers, commuters, and long-distance travelers are consistently exposed to freeway advertisements. They reach a mass audience in a short amount of time. Billboards have a low CPM, so you are getting the most value for your money. According to the OAAA, billboards cost $3.38 – $8.65 per thousand impressions. OOH delivers the same audience at a significantly lower cost compared to other media formats. Outdoor advertising is 80 percent less expensive than TV, 60 percent less expensive than newspapers and 50 percent less expensive than radio. There is no doubt that freeway billboard advertising is a beneficial addition to any marketing campaign! The location of the freeway billboard is crucial. A prime spot with an unobstructed view that will target the ideal audience. Focus should also be on a great eye-catching design for the billboard. There is a lot to contemplate when looking to add freeway billboard advertisements to a marketing campaign, but the investment is worth it. Ready to pave the way to a great freeway billboard advertising campaign? Check out BillboardsIn to get your advertisement up and running!